When a phone illuminates at night, it’s blinding. When it buzzes during the day, it’s distracting and when it’s far away it’s tempting. Cell phones attract people for reasons such as entertainment, productivity and communication, but can still be harmful, according to recent studies. Attention Deficit Hyperactivity Disorder (ADHD) is a condition that shows high signs of trouble with concentration, impulsiveness and inability to sit still according to PsychCentral. The links between cell phone use and this condition are evident, but do electronics affect some individuals more than others? Everyone’s bodies react relatively the same, but mental stability coordinating with cell phones varies for those using it directly and observing the operation. In classes at RBHS, cell phone usage is up to the teacher. For Spanish teacher Kris Arthur, the classroom policy is against cell phone use during class. The National Education Association (NEA) reported one way to keep cell phones in class from distracting students is to keep them strictly for educational use. Even then, however, a number of distractions come with the mobile device. From notifications to temptations to switch to social media, cell phones are often too much of an inclination for students. At home, cell phones can become even more of a tool to divert from education. For Patel, it all comes down to accessibility. Without phones giving the tools to be distracted, they are unable to possibly harm mental state. In order to keep devices from possibly facilitating ADHD, however, there must be motivation to keep it away. Patel also believes cell phones can be addictive. He notes the interactions with his friends becoming distant due to cell phone use. An article from MedicalDaily, an informational medical site finds that even if it’s not in use, cell phones still become a distraction. Bill Thornton, a psychologist at the University of Southern Maine, conducted a study to see if this was true. He assigned two groups of people with the same task, however, only one group was able to have their cell phone in sight. Thornton found the group without the cell phone were able to achieve 26 correct answers compared to the other group’s score of 21. With these statistics at hand, freshman Greta Scheidt agrees that cell phones are a distraction. Staying away from phones prevents them from causing harm, but 73 percent of teens have access to a smartphone according to Pew Research, making it increasingly difficult to keep distance. 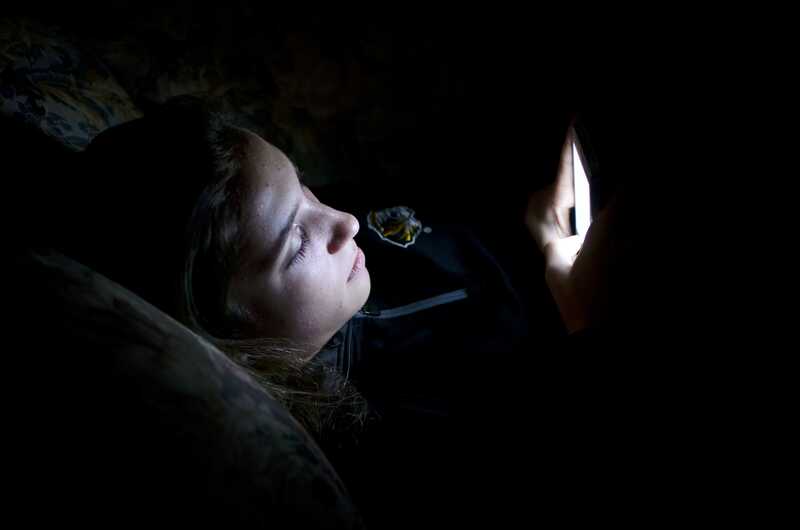 Common Sense Media recorded on average, teens spend nine hours a day on their phone. Senior Ben Rouder finds he has more important things to do rather than be on his phone, such as homework, relaxing or spending time with friends. As cell phone exposure is difficult to avoid, it is crucial to know how they can affect physical health. A study by Yoon Hwan Byun of the Department of Medicine at Dankook University College of Medicine in Korea measured levels of ADHD in elementary school children. A significant vulnerability was only shown among the children who were exposed to radio frequency (RF) which caused an increase of lead in their blood. RF comes from direct exposure to cell phones for an extended period of time. Although technically a change from the device inside the body is occurring, it is harder to be detected than noticing someone fidgeting in their seat may be. Nonetheless, cell phones are and will continue to be an everyday use for most people. With Americans checking their phone 8 billion times a day, cell phone use is far from coming to an end. “It’s not ADHD. It’s people getting attached to current events and not dealing with it in a productive way,” Patel said. Do you think cell phones promote ADHD? Leave a comment below! I am torn both ways on this article. While I do feel we as a society are far too attached to phones and other electronic devices and they are a big distraction in our lives. I also do not feel it is a cause for ADHD, although it could be a factor I am not sure where I stand on this. Thank you for sharing and I look forward to reading more of your writing.